In perfused hearts, high calcium-induced inotropy results in less developed pressure relative to myocardial oxygen consumption compared to the β-adrenergic agonist dobutamine. Calcium handling is an important determinant of myocardial oxygen consumption. Therefore, we hypothesized that this phenomenon was due to reduced myofilament responsiveness to calcium, related to protein kinase C activation. Developed pressure was significantly higher with dobutamine compared to high perfusate calcium of 3.5 mM (73 ± 10 vs 63 ± 10 mmHg, p < 0.05), though peak systolic intracellular calcium was not significantly different, suggesting reduced myofilament responsiveness to intracellular calcium with high perfusate calcium. The ratio of developed pressure to myocardial oxygen consumption, an index of economy of contraction, was significantly increased with dobutamine compared to high perfusate calcium (1.35 ± 0.15 vs 1.15 ± 0.15 mmHg/μmoles/min/g dry wt, p < 0.05), suggesting energetic inefficiency with high perfusate calcium. The specific protein kinase C inhibitor, chelerythrine, significantly attenuated the expected increase in developed pressure when increasing perfusate calcium from 2.5 to 3.5 mM (3.5 mM: 64 ± 8 vs 3.5 mM + chelerythrine: 55 ± 5 mmHg, p < 0.05), though had no effects on dobutamine, or lower levels of perfusate calcium (1.5 to 2.5 mM). By measuring intracellular calcium, developed pressures and myocardial oxygen consumption in perfused mouse hearts, these results demonstrate that high perfusate calcium positive inotropy compared to dobutamine results in reduced myofilament responsiveness to intracellular calcium, which is associated with energetic inefficiency and evidence of protein kinase C activation. During positive inotropy there is an increase in ATP utilization and thus myocardial oxygen consumption related to increased cross-bridge cycling and calcium handling . Heat measurements of isolated heart muscle have assigned approximately 50% of total energy consumption to cross-bridge cycling and 20% to calcium cycling . However, recently, studies in both isolated hearts and myocytes [3, 4], examining the energetic effects of increasing inotropy with the calcium sensitizing agent EMD 57033 have suggested that the energetic cost associated with increasing inotropy is largely related to calcium cycling. In these studies EMD 57033 resulted in only small increases in myocardial oxygen consumption and this was felt related to the ability of EMD 57033 to increase inotropy without increasing calcium cycling (though intracellular calcium was not directly measured). Consistent with this Brandes et al  have studied the contribution of mechanical work and calcium cycling to total mitochondrial ATP hydrolysis as measured by NADH levels using fluorescent spectroscopy of rat cardiac trabeculae. They concluded that there was an equal contribution of mechanical work and calcium cycling to total ATP hydrolysis. In the present study, we hypothesized that energy consumption during altered inotropy is largely to related calcium handling. To study this we directly measured developed pressures, myocardial oxygen consumption and used a newly developed technique to measure intracellular calcium in perfused mouse hearts with the calcium sensitive fluorescent dye rhod-2 [6, 7] during calcium-induced inotropy and with dobutamine. In addition we studied the perfused mouse heart, as the ability to manipulate the murine genome will likely provide important information about the molecular determinants of energy consumption in the heart. The mechanisms controlling calcium-induced inotropy are probably several fold, and include activation of protein kinase C , of which several isoforms are calcium dependent. Protein kinase C decreases maximal actomyosin MgATPase activity through phosphorylation of troponin I . This would be predicted to result in a reduction in force (or developed pressure) relative to intracellular calcium resulting in an energetically inefficient state. Thus, we predicted that high perfusate calcium positive inotropy would result in lower developed pressures relative to both intracellular calcium and myocardial oxygen consumption compared to dobutamine, and that high perfusate calcium would be associated with evidence of protein kinase C activation, though not dobutamine. During increases in perfusate calcium (1.5 – 3.5 mM) there were stepwise increases in developed pressure, and developed pressures with dobutamine were significantly higher than perfusate calcium 3.5 mM (Figure 1A). Peak systolic intracellular calcium increased minimally between 1.5 and 2.5 mM despite significant increases in developed pressures indicating increased myofilament responsiveness to calcium at perfusate calcium 2.5 compared to 1.5 mM (Figure 1B). 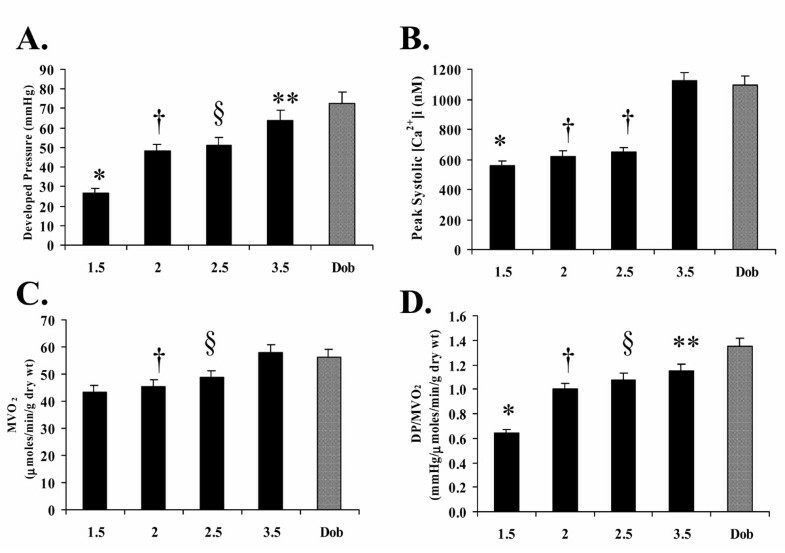 Also, indicating reduced myofilament responsiveness to perfusate calcium 3.5 mM compared to dobutamine, levels of peak intracellular calcium were similar for these 2 interventions despite higher developed pressure with dobutamine. Increases in myocardial oxygen consumption reflected the changes in peak intracellular calcium, in that there were minimal changes between 1.5 and 2.5 mM perfusate calcium, and myocardial oxygen consumption was not significantly different between perfusate calcium 3.5 mM and dobutamine (Figure 1C). Thus, the ratio of developed pressure to myocardial oxygen consumption, an index of economy of contraction, significantly increased between 1.5 and 2.5 mM perfusate calcium and was significantly higher with dobutamine compared to high perfusate calcium (Figure 1D). To further explore the differences between dobutamine and high calcium positive inotropy, analysis of pressure and calcium transient waveforms and phase-plane plots relating pressure to calcium was performed. Pressure waveforms were significantly abbreviated with dobutamine compared to high perfusate calcium (total waveform duration: 100 ± 15 vs 125 ± 0 ms, p < 0.01). The time from onset of the pressure waveform to peak pressure was not significantly different between dobutamine and high calcium (45 ± 3 vs 52 ± 7 ms, p=NS), though the time from peak pressure to fall to baseline was significantly shorter with dobutamine compared to high calcium (55 ± 12 vs 73 ± 7 ms, p < 0.05). An example of a normalized pressure waveform is shown in Figure 2. 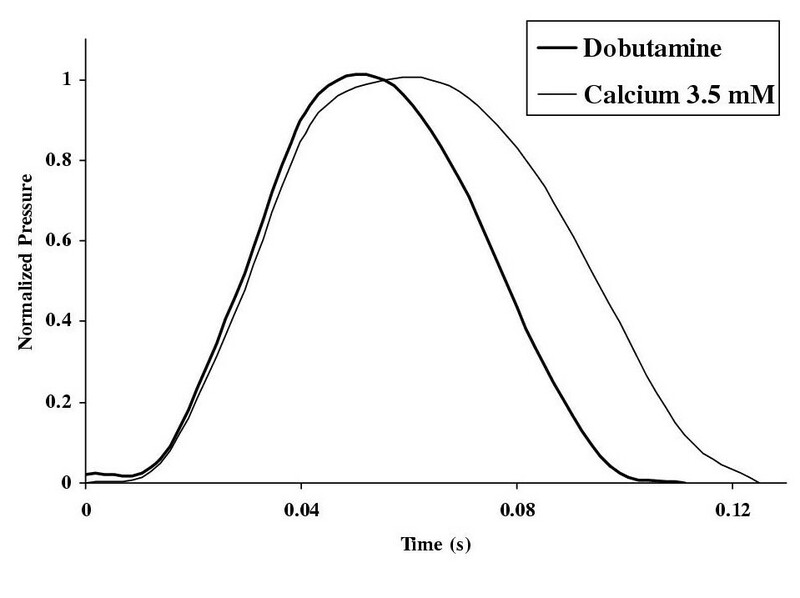 No significant differences were seen with calcium transient durations at any level of perfusate calcium or dobutamine (examples Figure 3A,B and 3C). Total transient duration at 3.5 mM perfusate calcium was 106 ± 20 ms and with dobutamine was 93 ± 22 ms (p=NS), and there was also no significant difference in the time from onset of the transient to peak (3.5 mM perfusate calcium 33 ± 8 vs dobutamine 38 ± 14 ms, p=NS), or difference in the duration between the peak of the transient to return to baseline (3.5 mM perfusate calcium 72 ± 25 vs dobutamine 60 ± 25 ms, p=NS). 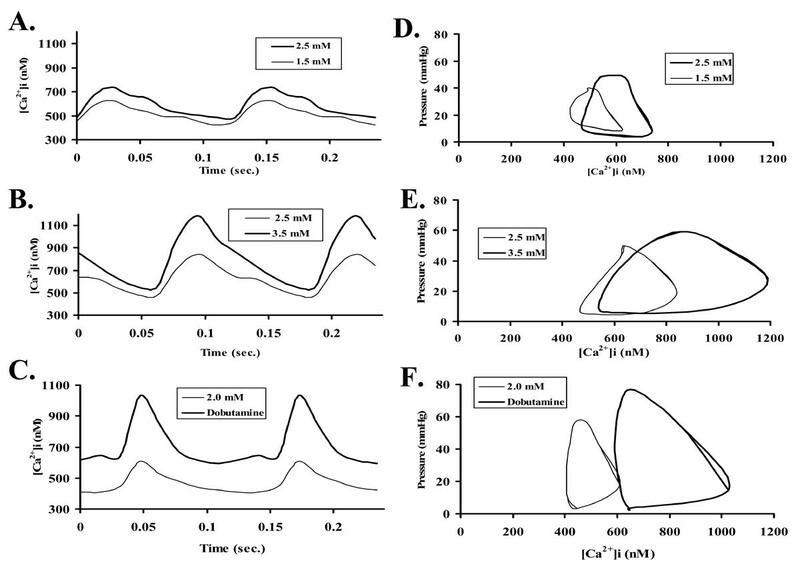 Phase-plane plots illustrate that high perfusate calcium results in a similar increase in intracellular calcium compared to dobutamine though relatively smaller increase in pressure (Figure 3D,E, and 3F). Thus, the ratio of pressure to calcium at the point of peak systolic pressure is significantly higher with dobutamine compared to high perfusate calcium (0.103 ± 0.009 vs 0.081 ± 0.012 mmHg/nM, p < 0.05, Figure 4). The increase in the 'dynamic trajectory' of the phase-plane plot between peak calcium and peak pressure may relate to underlying changes in the steady-state force-calcium relationship as proposed by Hunter . Example of normalized pressure waveforms for dobutamine and 3.5 mM perfusate calcium, illustrating abbreviation of the dobutamine waveform compared to 3.5 mM perfusate calcium. A: Averaged calcium transients (6–8 cycles) at perfusate calcium 1.5 and 2.5 mM, B: perfusate calcium 2.5 and 3.5. mM, and C: perfusate calcium 2.0 mM and with dobutamine. D. Phase-plane plots of pressure and calcium at perfusate calcium 1.5 and 2.5 mM, E: perfusate calcium 2.5 and 3.5. mM, and F: perfusate calcium 2.0 mM and with dobutamine. Averaged phase-plane plots for high perfusate calcium and dobutamine. While the increase in intracellular calcium is similar for both, at peak pressure the ratio of pressure to intracellular calcium is significantly higher with dobutamine (* p < 0.05). 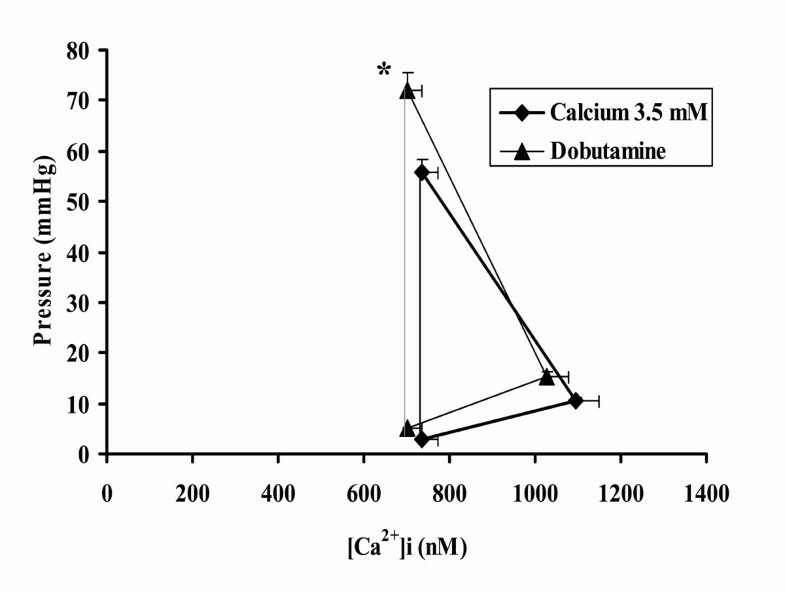 The specific protein kinase C inhibitor chelerythrine significantly inhibited high calcium positive inotropy (2.5 to 3.5 mM, p < 0.05), though had no effects on dobutamine, or with lower levels of perfusate calcium (1.5 to 2.5 mM) (Figure 5A). The effects of chelerythrine were mediated through preventing the expected increase in systolic and diastolic intracellular calcium (figure 5B). The difference in myocardial oxygen consumption between 2.5 and 3.5 mM perfusate calcium was significantly reduced with the addition of chelerythrine (Δ 2.5 to 3.5 mM alone: 9.1 ± 2.8 vs Δ 2.5 to 3.5 mM + chelerythrine: 5.4 ± 1.2 μmoles/min/g dry wt., p < 0.05). Also, chelerythrine had no significant effects on developed pressures at a constant perfusate calcium of 2.5 mM (53 ± 9 to 50 ± 10 mmHg, p=NS). A. Effects of protein kinase C inhibitor (PKCi) chelerythrine on inotropic responses (developed pressure) of perfusate calcium 1.5 to 2.5 mM (left), 2.5 to 3.5 mM (middle), and dobutamine (right). B. Effects of PKCi with perfusate calcium 2.5 to 3.5 mM (left) on peak systolic intracellular calcium, and basal diastolic calcium (right). Baseline controls values (perfusate calcium 1.5, 2.0 or 2.5 mM) for these experiments include those experiments with addition of chelerythrine to the higher perfusate calcium or dobutamine after control measurements, combined also with those experiments without chelerythrine. * p < 0.05, and ** p < 0.005. In the present study we have directly related developed pressures, myocardial oxygen consumption and intracellular calcium in perfused mouse hearts. The results demonstrate that there are significant differences between high perfusate calcium and the predominant β-adrenergic agonist dobutamine in the perfused mouse heart. High perfusate calcium results in less myofilament calcium responsiveness and reduced energetic efficiency compared to dobutamine and also is dependent in part on protein kinase C activation. There are also significant differences in myofilament responses to calcium and energetic efficiency between different levels of perfusate calcium. These data support the hypothesis that intracellular calcium cycling is responsible for a significant proportion of total myocardial oxygen consumption during changes in inotropy , and thus alterations in myofilament protein calcium responsiveness may result in a significant effect on the energetic characteristics of a particular inotrope. 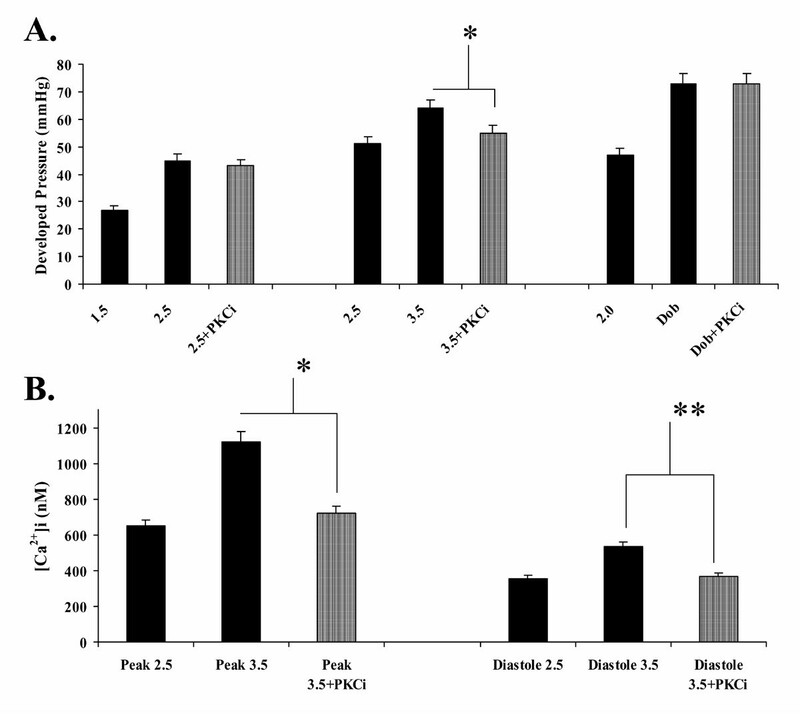 Protein kinase C phosphorylation of troponin I (predominantly at serines 43/45) results in a decrease in maximal actin-myosin ATPase activity , and also a decrease in the calcium sensitivity of the contractile apparatus through cross-phosphorylation of protein kinase A sites (serines 23/24) on troponin I . Dobutamine, which is predominantly a β-adrenergic agonist, activates protein kinase A, which mediates a reduction in the calcium sensitivity of the contractile apparatus through phosphorylation of troponin I, though it does not effect maximal actin-myosin ATPase activity . The findings suggesting that protein kinase C is activated at higher levels of perfusate calcium (though not with dobutamine) may indicate a role for protein kinase C in the energetic inefficiency associated with high calcium. That force does not increase proportionate to the rise in intracellular calcium during calcium-induced inotropy maybe related to 'down stream' effects of protein kinase C, such as phosphorylation of troponin I reducing maximal actin-myosin ATPase activity . Indeed, recently we have shown that in a transgenic mouse expressing mutant troponin I lacking protein kinase C phosphorylation sites that during high perfusate calcium inotropy that there is a significant elevation in the ratio of developed pressure to myocardial oxygen consumption relative to wild type controls . This data together with the data in the present manuscript provides reasonable evidence that activation of protein kinase C during high calcium-induced inotropy reduces maximal myofilament calcium responsiveness resulting in a decrease in developed pressure relative to peak systolic calcium, and energetic inefficiency. Also, conditional expression of protein kinase C β in mice , which is well suited to study the immediate effects of protein kinase C activation, is associated with increased contractility and calcium transients and decreased maximal tension development by myofilaments when expression is turned on. This compares favorably with our data showing that protein kinase C inhibition results in decreased contractility and reduced calcium transients. The abbreviation of the pressure waveforms with dobutamine compared to high perfusate calcium is another marked difference between these 2 forms of positive inotropy. Differences in phosphorylation of proteins involved in relaxation such as troponin I and phospholamban may account for this [15, 16]. We have not found any difference in the calcium transient duration to accompany the pressure waveform findings. This may relate to the relatively limited number of sampling points (N = 8) used in obtaining calcium transients or motion artifact related to the inotropic state. Recent improvements in acquisition software and recording capabilities will likely improve our ability to analyze calcium transients in detail. Isolated perfused mouse heart measurements of intracellular calcium and energetics have been performed using other methods by other investigators [17, 18]. The unique aspects of the present study are that we use the calcium sensitive fluorescent dye rhod-2 to measure intracellular calcium [6, 7], and that we have related these measurements to both myocardial oxygen consumption and developed pressure. An appreciation of the strengths and limitations of these techniques is required to critically evaluate the results. For instance, measurements of intracellular calcium are taken from the outer layers of the left ventricular free wall, though our measurements of myocardial oxygen consumption and developed pressures are global measurements. Differences between the epicardium and endocardium have been described  and our measurements of intracellular calcium do not take this into account, and regional differences in myocardial strains and oxygen consumption are also not accounted for. However, one advantage of using rhod-2 is that its long excitation and emission wavelengths relative to other calcium sensitive dyes results in minimal filtering of excitation and emission light and autofluorescence [7, 20]. At these visible range wavelengths light may penetrate between 0.3 and 0.4 mm into the myocardium  which may be significantly deeper than shorter wavelength dyes. This is approximately 50% of the total wall thickness in the mouse , and thus our measurements are from the outer 50% of the myocardium. Measurements of intracellular calcium and myocardial oxygen consumption have been performed in different hearts due to the difficulty in obtaining these measurements in a single experiment, and this may introduce variability into the results. We have also performed only 2 interventions per heart. The time taken to obtain stable measurements of effluent oxygen saturations used in the calculation of myocardial oxygen consumption is approximately 30 minutes and the mouse heart preparation is usually not stable beyond 80 minutes, so that only 2 interventions can be obtained. Furthermore, when comparing different inotropes such as high calcium and dobutamine, it is desirable not to use the same heart. As we have postulated that different signaling pathways may be activated by these inotropes, serially administering these to a single heart may result in persistent activation of a protein kinase even after washout of that agent. Coronary flow does not increase with inotropes in this study, though other studies with perfused mouse hearts have shown an increase . The reason for this is unclear, though oxygen delivery to the heart is not compromised. We have the advantage with the use of the absorbance spectrum between 500 and 600 nm, used in the calculation of intracellular calcium, that this is also sensitive to the presence of deoxy- or oxygenated myoglobin . With our technique the myoglobin spectrum is invariably consistent with full oxygenation and any (rare) hearts that do not show this pattern are discarded. By using physiological heart rates and temperatures we have attempted to reproduce normal murine physiological conditions. As the mouse heart has a negative force-frequency response at physiological heart rates , developed pressures in our studies are lower than might be expected with lower heart rates. Nevertheless, the developed pressures in this study are quite consistent with other studies [17, 24, 25]. That pressures in perfused mouse heart studies are generally low may relate to the resistance of the murine myocardium to extracellular calcium . Diastolic calcium levels are relatively high with this method especially with dobutamine or 3.5 mM perfusate calcium (table 1). This appears at least in part related to the limited sampling of 8 time points per beat in the current paper, and may also relate to motion artifact associated with the positive inotropes. These limitations are especially prominent in the small and rapid beating mouse heart. Recently, improved analogue to digital capabilities and software acquisition has significantly improved our ability to record many more time points during the cardiac cycle, and with this we have noted slightly higher differences between peak and diastolic calcium levels (MacGowan and Koretsky, unpublished data). It appears unlikely that this is related to a calcium overload state as diastolic pressures do not rise with high perfusate calcium or dobutamine, and pressure waveforms abbreviate with dobutamine. Additional functional data, not included in Figure 1. Symbols for coronary flow column: * p < 0.05 vs 2.5 mM; † p < 0.05 vs dobutamine Symbols for diastolic calcium column: * p < 0.005 vs perfusate calcium 3.5 mM and dobutamine; † p < 0.05 vs perfusate calcium 3.5 mM and dobutamine. In the perfused mouse heart, high perfusate calcium positive inotropy compared to dobutamine results in reduced myofilament calcium responsiveness, decreased energetic efficiency and is dependent in part on protein kinase C activation. It must be recognized that agents that increase the amplitude of the calcium transient through activation of protein kinase A, such as phosphodiesterase inhibitors are associated with adverse outcomes in congestive heart failure patients , and so our findings with dobutamine are unlikely to translate into clinical benefit. Nevertheless, these results illustrate the importance of calcium handling in the energetic efficiency of an inotrope, and these methods will be useful in studying genetically engineered mouse models with altered myofilament calcium responsiveness. Experiments were performed in 2 groups. In one group, developed pressure and myocardial oxygen consumption were measured in the perfused mouse heart. In another group of perfused hearts intracellular calcium and developed pressure were measured. Male mice (129/SV ter strain, mean weight 26.9 ± 2.6 g) were used. Anesthesia was induced with 1.5 to 3.0 mg of intraperitoneal pentobarbital sodium, and the animal was anticoagulated with 100 units of heparin. The heart was removed from the chest and the aorta was cannulated with a 23 gauge needle. Retrograde coronary perfusion at a constant perfusion pressure of 55 mmHg with oxygenated modified Krebs solution was started. The Kreb's solution consisted of (mM): NaCl 112, KCl 4.7, MgSO4 1.2, Na-EDTA 0.5, NaHCO3 28.0, Glucose 5.5, Pyruvate 5.0, CaCl2 2.5, 50 μM octanoate, and pH was adjusted to 7.4. For some studies the concentration of calcium was varied to produce an inotropic effect. The concentration of NaCl was adjusted accordingly for these experiments to maintain osmolality. To eliminate the effects of cathecholamine release by pacing esmolol (0.1 μM) (Du Pont, Wilmington, DE) was added to the perfusate. The temperature of the perfusate entering the heart was set at 37°C. Flow was monitored with a glass flow meter. A rubber latex balloon on the end of a plastic cannula, was inserted into the left ventricle through an incision in the left atrium. This was then connected to a Gould pressure recorder (Gould, Cleveland, Ohio) for measurement of left ventricular pressure. The left ventricular diastolic pressure was set at 0 – 5 mm Hg using a micro-syringe. Hearts were paced at 8 Hz which is physiological heart rate for the mouse, using a stimulator with one lead inserted into the right ventricle and the other adjacent to the epicardium. In the myocardial oxygen consumption experiments, the perfused mouse heart was placed in a glass, water jacketed chamber, which was sealed at the top. Myocardial oxygen consumption was determined from influent and effluent oxygen content (measured by blood gas analyzer, ABL-30, Copenhagen, Denmark) and flow rate. The methods used to measure intracellular calcium with rhod-2 in perfused hearts have been previously extensively described [6, 7, 20]. Rhod-2 (Molecular Probes, OR, 100 μg) was dissolved with dimethylsulfoxide (DMSO, 4 μL) and dH2O (200 μL), and loaded through the coronary perfusate. After the washout period serial measurements of fluorescence alternating with absorbance were taken. Fluorescence scans were taken at high time resolution to allow quantification of changes in fluorescence during the cardiac cycle. Excitation at 524 nm and emission at 589 nm was used for fluorescence measurements. where R524 is the reflectance intensity at the rhod-2 sensitive point of 524 nm, and R589 is the rhod-2 insensitive point, before ()0 and after ()rhod2 loading. At the end of the perfusion protocol, maximal fluorescence, used in the calculation of [Ca2+]i was determined by tetanizing the heart with a bolus of calcium chloride (20 mM) without any energy substrate, and with cyclopiazonic acid (Sigma Chemical Co., 10 μM), which is a potent inhibitor of Ca2+-ATPase and thus blocks calcium uptake by the sarcoplasmic reticulum . Fluorescence and pressure were monitored continuously, and the point of maximal fluorescence was taken as the point were pressure stabilized at a steady state. To account for changes in light scattering properties from the heart during tetanization, the maximal fluorescence was corrected by multiplying by the ratio of R524 pre-tetanization to R524 during tetanization . where Kd is the dissociation constant for rhod-2 and calcium (determined by in-vitro calibration with rhod-2 and myoglobin by del Nido et al, ref , and confirmed by in-vivo manganese quenching, ref ) and is 710 nM, Ft = fluorescence at time t, Fmax =maximal fluorescence from tetanized heart, and the fluorescence from the heart assuming rhod-2 had no calcium bound is given by F0 = Fb + a(Fmax - Fb), where Fb is the background counts from the heart prior to dye loading, and a = rhod-2 fluorescence in the absence of calcium / rhod-2 fluorescence in the presence of saturating calcium. For rhod-2 the value of a is approximately 0, thus for rhod-2, F0 was assumed to be equal to Fb. To account for changes in dye concentration, formula 2 needs to be modified to account for changes in absorbance (Arhod-2, formula 1) due to dye leakage. where At = dye absorbance at time t, Amax is dye absorbance just prior to tetanizing the heart. Amax is not determined when heart has tetanized because of the marked influence of the shape change and desaturation of myoglobin on the reflectance spectrum. For each heart only a baseline and one intervention was used, and N = 4–6 for all groups. The time to achieve a stable state (particularly with respect to effluent PO2 concentrations) or load rhod-2, and then acquire baseline data and perform 1 intervention is 60–90 minutes, beyond which the preparation is not stable and so more than 1 intervention per mouse heart was not undertaken. In the developed pressure/oxygen consumption experiments, the following interventions were used: 1) varying perfusate calcium from baseline 2.5 mM to 3.5; 2) baseline perfusate calcium 1.5 mM to 2.5 mM; 3) baseline perfusate calcium 2.0 mM and then addition of dobutamine 0.9 μM. ; 4) to antagonize the effects of protein kinase C, the specific antagonist chelerythrine (ref 30; 10 nM, Calbiochem-Novabiochem Intl, La Jolla, CA) was added to the perfusate when inducing positive inotropy. In all of these the chelerythrine was added to the perfusate containing the higher level of perfusate calcium or dobutamine. This dose was chosen to reduce the expected increase in pressure with perfusate calcium 3.5 mM by 50% after dose ranging studies (1 nM to 1000 nM). In addition in another group of experiments during constant infusion of perfusate calcium 2.5 mM, chelerythrine was added without changing perfusate calcium concentration. In all experiments, the control period was followed by the intervention, and repeated measurements of both developed pressure and myocardial oxygen consumption were taken for a period of approximately 30 minutes. Measurements of intracellular calcium were performed 1) at perfusate calcium concentrations at baseline of 2.5 mM increasing to 3.5 mM, 2) decreasing from 2.5 to 1.5 mM, and 3) 2.0 mM baseline with subsequent addition of dobutamine 0.9 μM. The effects of chelerythrine on intracellular calcium was only determined for those interventions with which chelerythrine had significant effects on myocardial oxygen consumption and developed pressure. One way analysis of variance with the Scheffe test was used to test significance of differences between groups. Developed pressure data from the myocardial oxygen consumption and intracellular calcium experiments were combined as this was obtained under the same experimental conditions. The ratio of developed pressure to myocardial oxygen consumption was derived as an index of economy of contraction. Data are expressed as mean ± standard deviation. Supported by AHA PA Affiliate Grant-in-Aid Beginning (B98452P) and NIH grant (HL-03826) to G.A.MacG, and National Institutes of Health Grant RR-03631 to the Pittsburgh NMR Center for Biomedical Research, and NIH Grant (HL-40354) to A.P.K., and the NINDS intramural research program.